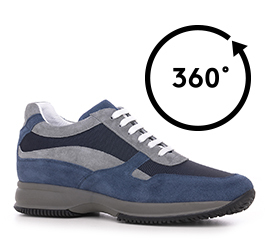 Handcrafted elevator sneakers with upper in navy blue technical fabric and grey and dark blue suede. Ultralight rubber sole in dark grey. The inner elevator system will increase the total height up to 4 inches (10 cm) in comfort and secrecy.